The most famous rare steak made on an open flame is Pittsburg rare; it was believed that Pittsburgh steelworkers would bring hunks of meat for lunch instead of usual sandwiches. When lunchtime came, they would take the meat and sear it against a slab of hot metal in the mill. The effect, a blackened exterior around a super rare core. 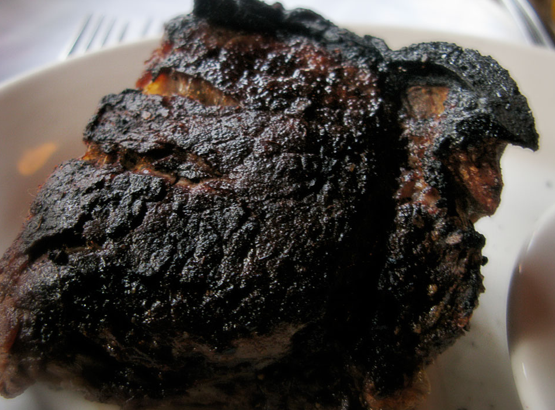 It is also lore that the blackened meat was made by a blow torch, a steak was taken and quickly blackened by the heat of a blow torch which can reach temperatures as high 3160 °C. Either way the carcinogens in the blackened beef will likely give you some form of cancer. This article is interesting for BBQ aficionados, those meat eaters who enjoy the thrill of barbequing at home, the taste of charred beef made over a super hot BBQ. Many subscribe to the barbeque as a suitable way to cook, an easy way to control the mess and add flavor. It is true that a barbeque is thrilling, the act of barbequing is often exciting but charring is not recommended. Well the thrill is deflated very quickly when meat is subjected to extreme temperatures that burn the meat’s surface. Yes flavors are imparted by smoke, condensation and micro particles who give complex flavors there is a fine line between charring and barbequing correctly. When meats are cooked at high temperatures, typically over an open flame or hot coals, the intense heat generated converts otherwise beneficial amino acids. It causes hetero cyclic amines (HCAs) known carcinogens. Research has shown that hetero cyclic amine formation in meat occurs at high cooking temperatures, when amino acids and creatine (a chemical found in muscles) react at high cooking temperatures. Researchers have identified 17 different hetero cyclic amines resulting from the cooking of muscle meats that may pose human cancer risk. Think twice when it comes to high temperature cooking and try marinating, a process that is said to reduce these harmful compounds from forming. According to several recent studies, marinating meat basically protects it from becoming damaged by high heat. And the reason for this, at least according to some informed experts, is that marinades typical contain herbs, spices, and other agents that are high in antioxidants.